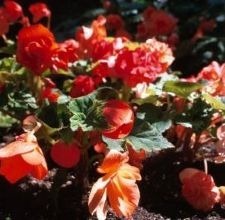 Begonias can add a splash of bright colors to your outdoor landscape or potted container garden. They’re also relatively easy to care for. 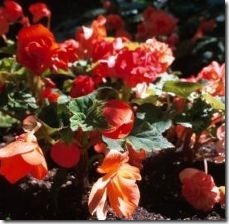 Instead of buying mature begonias from a garden store or nursery, save money by germinating the plant’s seeds at home. To get plants that are ready to bloom by summer, the University of Minnesota suggests propagating the seeds in December or January. Fill a shallow seed tray with sterile, soilless seed starting mix. These trays are specifically designed for propagating seeds and are typically only a few inches deep. Fill the tray to within 1/2 inch of its top edge. Sprinkle the tray with water so it’s evenly moist–to avoid disturbing the soilless mix, you may wish to use a spray bottle–or, if the tray has drainage holes on the bottom, place it in another tray full of water. The tray-within-a-tray setup is ideal for preventing overwatering and reducing the chances of your begonia seeds being overgrown with fungus, reports Cornell University. Plant the begonia seeds. Lightly press one or two seeds a couple millimeters into the surface of the soilless seed mix, spaced apart by a couple inches. Cover the top of the seed tray with plastic kitchen wrap. This traps the moisture in the tray and keeps the soilless mix evenly moist. It also allows the seeds to grow without being disturbed by watering. Place the tray in an area that receives light but not direct sunlight. For the best germination rates, the temperature around the seeds should be approximately 65 to 70 degrees Fahrenheit. Remove the plastic wrap once the begonia seeds have sprouted and broken the surface. This usually takes about seven days. Once the wrap has been removed, begin misting the tray once a day with water. Begonia seeds are very small, so be careful not to drop them or let them blow away. An ounce of begonia seeds holds approximately 2 million seeds.